I spent three hours walking along the Wissahickon on Thursday. I had no intention of doing this. I was supposed to be inside working on a new painting. But sometimes it seems as if I'm forcing a new painting when I'm really not sure what I want to do. In that case it's often better to just drop it and go for a walk. Given that spring migrants are starting to arrive it wasn't hard to convince myself to do so. It started off sunny but became overcast almost instantly and stayed that way. Unlike a week ago, where the woods was filled with the sounds and sights of birds, it couldn't have been quieter. When I finally got down to the water I found some small birds high in the hemlocks and sycamores. Unfortunately they had all their color washed out by the overcast sky. Among the birds I did find were: one Brown Creeper, one Golden-Crowned Kinglet, one American Goldfinch and some unidentified warblers. The gray sky, and lack of calls, left me no choice but to leave them unidentified. From there I walked about a mile along the Wissahickon before doubling back on the other side of the water. Typical birds like Cardinals, Downy Woodpeckers, White-Breasted Nuthatches, et al., eventually totaled another 10 species. When I got back to where I'd first seen the unidentified warblers one lone Palm Warbler, my first for 2008, made an appearance. He was still high in the sycamores and hemlocks, but his rich burnt siena color shone through the gray, and his constantly twitching tale, confirmed his identity. While moving closer to get a better view of him I flushed a Hermit Thrush out of some rhododendrons for the second time in the past couple of weeks. I've noticed that the Hermit Thrush doesn't have a twitching tail so much as one that seems to be operated like a hydraulic lift. It seems to land, slowly raise its tail up horizontally and then slowly lower it back down, as though it's being controlled hydraulically. One of the reasons that birding remains so rewarding is that there's always something new like this to notice. 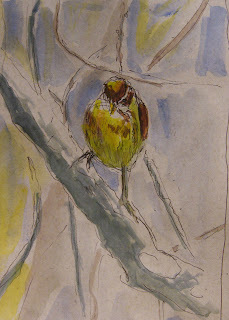 The drawing at top is a small pen and watercolor sketch of a palm warbler based on a photo I took about this time two years ago at the John Heinz Wildlife Refuge. The one big difference is that bright sunshine accentuated the rich golden and burnt siena colors of the Palm Warbler. Though they're not all that uncommon they remain one of my favorite warblers, I think because of both their early appearance and their striking colors. Though it was nice to be out I still had an abandoned painting to deal with when I got back home. Finally I decided to try some pen and ink sketches from some photos of a very cooperative Blackburnian Warbler that landed a few feet in front of my wife and myself last May. Working in pen and ink is a bit unforgiving. Unlike pencil or charcoal you can't erase your mistakes. This either gives an unbearably stiff quality to them, primarily from people who know all too well that you can't erase any marks that you put down, or alternatively can give them both greater sureness of touch and greater vitality. For some reason that seemed the best way to work my way towards a new painting. I guess it's sort of like thinking out loud, though in this case it's drawing out loud. 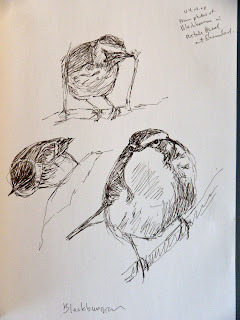 In doing 'bird' or 'wildlife' art my intent is both to be true to the subject matter and to make a work of art. As many people will tell you once you start talking about making 'art' you've made the task more complicated, not necessarily better just more complicated. I'm not going to go into great depth about this except to say that it can give some self-consciousness to the process that can be stifling. In my case for just this one new painting that included questions like: if I do a watercolor based on one the my recent photos of birds will they be too subject to the cropping/framing that often takes place in photos; do I really want to flatten out the space the way that some framing can do; do my photos have enough detail that I can adequately represent all parts of the bird; if some parts are in shadow do I know enough about the structure of birds to construct it from my imagination; am I making the painting too limited by sticking to what is in the photo; can I improvise elements that aren't in the photo; do i just want to do a vignette of a bird where it floats in empty space. Well obviously this is enough to put anyone to sleep, including the artist! For whatever reason I finally decided to start a new large watercolor based on photos of the same Canada Warbler in more or less the same position taken over a 1-2 minute period. This is something of a multi-vignette and I have no idea how I'll tie all the separate subjects together. I've never tried anything like this before. This is the initial pen and ink sketch. Tomorrow I start adding watercolor.